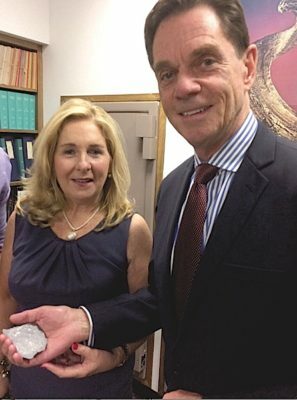 Shar and Robert Penfold holding piece of the moon at Natural History Museum luncheon. “It’s a party! 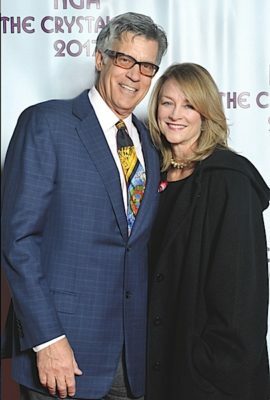 — for a cause,” exclaimed Kiel FitzGerald and Olivia Kazanjian, co-chairs of Needlework Guild of America, describing Hancock Park’s gala held at the Tagylan Complex on Vine St. on Feb. 24. So many in our neighborhood know that, when they come to this annual event, they are guaranteed to have FUN while drinking, bidding, dining and dancing the night away. They also know that the funds raised will provide new linens on the beds of Alexandria House, holiday gifts for the children of Uplift Family Services and new clothing for the gentlemen residents of McIntyre House; just a sampling of all that NGA does for the needs of charities in Los Angeles. 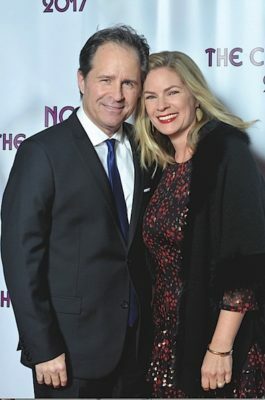 This year’s “Crystal Ball” did not disappoint with an elegant dinner, sparkling decor accented with shades of lavender and one-of-a-kind auction items, including gorgeous vintage furs from the collection of actress Beverly Garland modeled by her daughter Carrington Goodman. 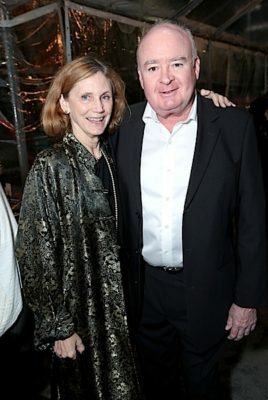 Among those there whose enthusiasm and generosity made it NGA’s most successful affaire ever were Paulina Moskalykova and Matt Solo, Donna and Greg Econn, Alexander Eddy, Dina and George Phillips, Stephanie and David Johnson, Susan and Sean Kneafsey, Isabel Mayfield, Nicole and Larry Perkins, Carolyn Cole, Anne and Michael Kim, NGA president Mary Jaworski and husband Bernie with extended family members Jake Bernstein, Meredith Martinuzzi, Janice Payson and Katie Jaworski, Mary Woodward, Oona and Don Kanner, Sondi and Pete Sepenuk, Michele and Scott McMullin, Susan Downey and David Franklin, Robin and Cameron Chehrazi, Marion and George Plato, Amanda and Anthony Mansour, Nora and Johnny Suk, Stephanie and Michael Sourapas, Robin and John Jameson, Leisha Willis, Anne Loveland, Lisa and Roger Morrison, Thomas Fenady, June and Paul Bilgore with son Bryan and daughter-in-law Elva, Simone and Chris Adams, Cara Saffro and Harold Rosenberg, Carol and Luis Fondevila, Beverly and Jason Brown, Ray La Soya, Michaela and Joe Burschinger, Megan Derry, Kiel FitzGerald’s husband Jeff Reuben and Olivia Kazanjian’s husband Steve, John Brumlik, and Paul Boettcher. 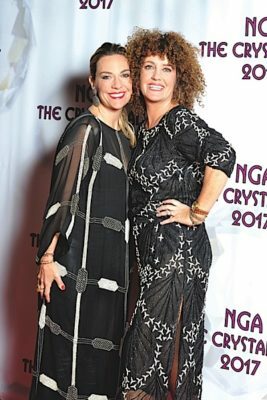 Olivia Kazanjian and Kiel FitzGerald, co-chairs, NGA Crystal Ball. Michael and Stephanie Sourapas at NGA Ball. Greg and Donna Econn at NGA Ball. NGA photos by Eduardo Lainez. 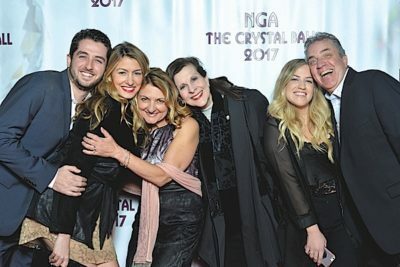 Left-to-right: Jake Bernstein, Meredith Martinuzzi, NGA President Mary Jaworski, Janice Payson, Katie Jaworski, Bernie Jaworski. The Mannequins of the Assistance League of Los Angeles held their “Afternoon with Eve” luncheon at the Beverly Hills Hotel on March 16. More than 150 ladies came to shop from a variety of pop-up boutiques that gave a percentage of their sales to the League’s philanthropic programs. Actor Tim DeKay of “White Collar” and “American Crime” fame welcomed guests as they enjoyed grilled Atlantic salmon with salsa verde while fashions by Theory came down the runway modeled by members of the Mannequins. “A better world begins with one act of kindness; doing good is never out of style,” said “Eve” honoree Barbara Lazaroff, lauded for her humanitarian endeavors around the world. A live auction ensued as Ms. Lazaroff enthusiastically jumped in to inspire bidders, as well as donating menu and wine pairings at Spago and Chinois. There from our ‘hood were Shelagh Callahan, Barbara Hardesty, Juliet Brumlik and Melanie Botcher cheering on models Jackie Kruse, Cheryl Van Tassel and Leah Houska. Also there were event chairman Galina Sobolev, Mannequin’s Auxiliary chairman Rebecca Trail, and Assistance League president Lisa Wierwille. 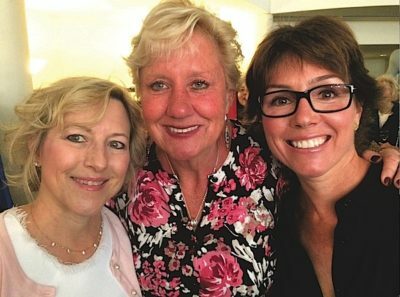 Assistance League President Lisa Wierwille, Shelagh Callahan, Juliet Brumlik at Mannequins Luncheon. Aaron Celestian and Patty Lombard at the Natural History Museum. 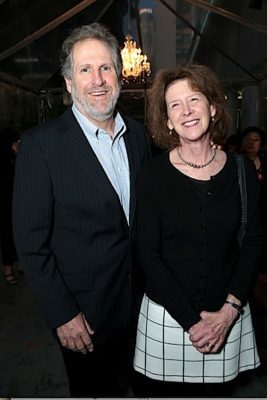 That all-important and historic institution of downtown Los Angeles, The Natural History Museum, was the scene of a luncheon hosted by two of its trustees, Patty Lombard and Caroline Labiner Moser, on March 17. 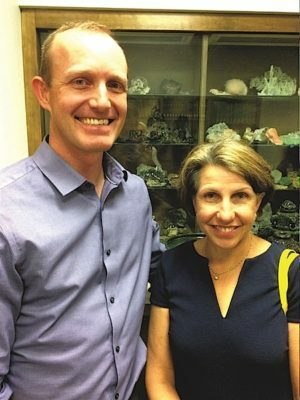 There were 16 lucky guests (it was St. Paddy’s Day) treated to a tour inside the vaults of rare gems and minerals, including the Juliet Pink Diamond, among the largest in the world on loan from a private collection. “Aaron has conducted so many of these tours, and I learn something completely new every time,” said Tom Jacobson, the Museum’s vice president of advancement. “Wait — this is a slice of the moon!” exclaimed Robert Penfold with wife Shar. Also there to share the wonder were Nancy Barron, Suzanne Labiner and Laura Lee Woods. That’s the chat — and because all of you are so busy doing good — that’s a lot!